It’s the most wonderful time of the year, as they say, and I am feeling a bit homesick. I know some may think that means homesick for “home” which would be Canada but others will realize exactly what I mean…. Disney. For me, home is Walt Disney World, as I’ve been going there at least once a year since I was 7 years old. I do love Disneyland, as I lived in Cali for 3 years, but home is where the heart is…. for me that’s Florida. Many people visit Walt Disney World for the Christmas festivities and assume that involves activities at the park. What about that last day when you want to enjoy the holiday fun but you don’t have a Park ticket? What about when you want to feel festive but don’t feel like fighting the crowds at the Parks?? Well, this brought me to thinking about the things I love to do that have absolutely nothing to do with the Parks. I decided to share some of my favorite ways to celebrate the holidays without ever entering a park… so here we go. 1. 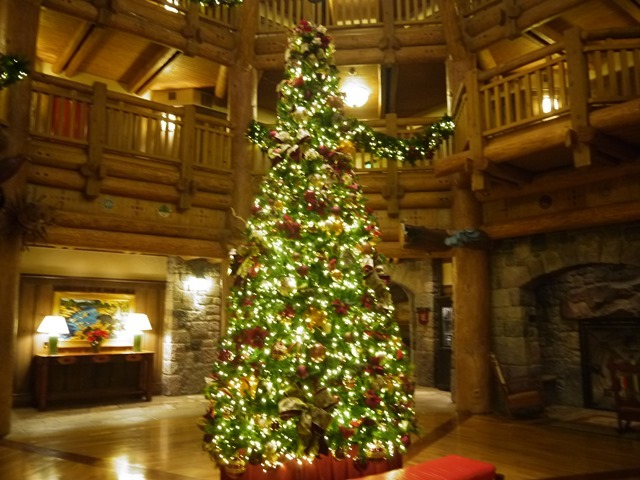 Visit Wilderness Lodge– This resort is one of my faves but especially in the winter. You grab yourself a hot chocolate and wander around the resort to look at the festive decor. After you’ve gotten in the spirit, you take that hot chocolate and head up to the rocking chairs or couches in front of the huge fireplaces where you curl up and stay warm and just smile. What is more festive than sitting in front of a roaring fire with a cup of cocoa, while Christmas music is playing in the background and holiday cheer fills the air??? It is something many people don’t know about and I feel bad for them. Try this. You will not be disappointed. 2. 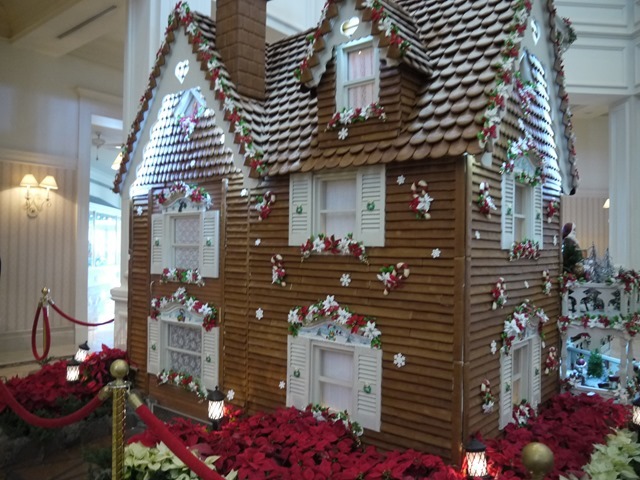 Check Out the Gingerbread House at The Grand Floridian– The life size gingerbread house at The Grand Floridian Resort is somewhat legendary. I am sure many of you know all about it… but do you take the time to go and see it? Aside from the fact the The Grand Floridian is a beautiful resort is decorated to the nines, the gingerbread house is worth getting off the monorail for. 3. Take A Sleigh Ride at the Fort Wilderness Resort and Campground– Did you know that you can go for a sleigh ride in Florida?? You can at the Fort Wilderness Resort! A giant red sleigh decorated for the holidays, with lights and garland, will take you for a ride departing from Crockett’s Tavern at Pioneer Hall. The ride takes around 25 minutes and is well worth it. Talk about getting you in the holiday spirit! 4. Check Out The Gingerbread Holiday Ice Castle at The Contemporary Resort– You were already on the monorail to check out the gingerbread house at The Grand Floridian so why not get back on and hop of at the Contemporary for this special treat. 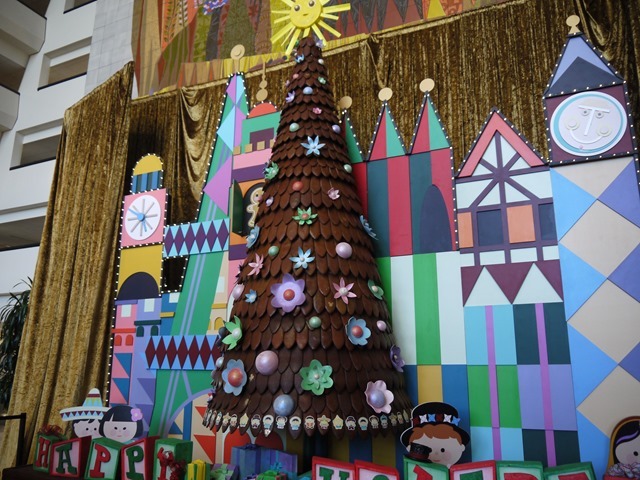 On the 4th floor concourse you will find this gingerbread castle featuring Frozen characters. You can even buy some holiday goodies! 5. Meet Santa at Downtown Disney– You didn’t think I’d let you miss Santa, did you?? At Santa’s Chalet in Downtown Disney, children young and old can visit with Santa and make any last minute requests. What trip during the holidays is complete without a visit with Santa? There you have some of my favorite things to do during the holidays without ever needing to enter a Park. Do you have any favorite things to do that I may have missed? Let me know in the comment box below! I’d love to try something new!